On Saturday L and I head down to London. This is for the inaugural London Landmarks Half Marathon, that I got into but L didn’t. There was doubt that we’d get here at all due to caring for poor old Doggo but with him sadly no longer with us it frees us up to do stuff like this again. So a weekend of dog free debauchery awaits although we’ll probably both sit worrying about the little tyke. Daughter dog sits and seems thrilled at the prospect of a weekend with the Lad. I’m sure she will video their day and keep us updated. Continuing our London tour we stay this time at the Holiday Inn in Victoria which is less than a mile from the start. After a restrained Saturday night around Victoria, we’re already for race day. Well I am, L is annoyed that Waterstone's Piccadilly doesn't open until 12 noon. Quite right too, they probably all want to watch the race. The race sold out in minutes when it went live last year although half the 10,000 places were kept back for charities which is very mean on us runners (but not on the charities obviously). In fact the whole event is ran by a charity, Tommy’s, but it’s an opportunity to run the sights of London without doing the full London Marathon. If you can get in that of course and this race looks like it could become as hard to get into as it’s big brother. After a very early breakfast due to the clocks going forward, we head to the start on Pall Mall. At the start there is a sea of yellow event t-shirts which were sent to us in advance along with a nice drawstring bag also in yellow. Obviously I’m not wearing mine and be warned that, if like me, you have a yellow t-shirt phobia the colour is unlikely to change in the future but as there is yellow event branding everywhere. There is supposed to be a wave start but this doesn’t really happen. You are given a start time and at about that time you join a long funnel which takes you to the start but once you get to the front, off you go, so it was more of a rolling start. Which was fine but it would have been helpful if they’d told us because some people simply slammed their anchors on and refused to start before their allocated start time creating a bit of a log jam. As I’ve said we only had one place between us, so my number has ‘X’ on it rather than my name. Just in case L had to step in if I was injured but I seem fine at the moment. Someone shouts out to me ‘Come on X-ey’. Not sure how to take that. There are ‘historical’ mile markers on the course, pointing out what they say are London’s quirky and hidden secrets. These remain hidden to me as naturally I miss most of them. Also some of the areas are apparently themed but again I miss out on these because I am concentrating too much on my race. I do spot most of the landmarks on route, although you do have to crane your neck around the odd skyscraper at times to see them and the route was very winding. I assume to cut down on road closures but I didn’t mind this too much. The finish line was just outside Downing Street where I was handed a medal by someone in fancy dress but I couldn’t for the life of me tell who they were supposed to be. L would have known. It’s a nice medal but, as I’m not a medal fan, I didn’t really look at too closely. Apparently it opens up like a locket, so I must get it out of the drawer sometime and have another look. The goodie bag wasn’t too bad, containing some food and a sweatband, in yellow of course, which I will use. Apparently the overall winner beat his Dad into second place, now there’s a obscure pub quiz question for you. I complete the course, uninjured, in 1:47. Not bad on little training. Now what to do afterwards. We had looked at seeing the ‘Book of Mormon’ but with the cheapest tickets at £96 each we go for the cinema instead. 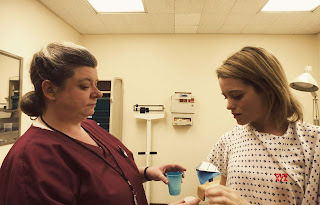 Unsane is a thriller come horror that was apparently all shot on an iPhone. Sawyer Valentini (Claire Foy) is a young woman attempting to rebuild her life, having moved to a new city to escape a stalker. However, she is struggling with that rebuilding job, finding herself unable to form relationships and seemingly constantly on the edge of a nervous breakdown. She then inadvertently tips herself over the edge when at a counselling session she confesses that she sometimes has suicidal thoughts. 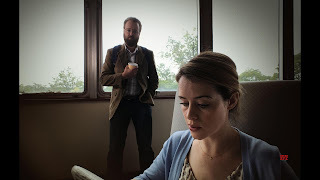 The therapist promptly asks her to sign a document agree ing to more sessions but then, before the ink is dry, a man in a white coat leads her away to a locked room. Unfortunately protesting that she’s been locked up by mistake just makes it look like she’s in denial. Then when she’s assaulted by another patient and fights back, it just reinforces the impression that she needs to be locked up and drugged up. Then when she gets side effects from the drugs, this is just another reason to keep her in. 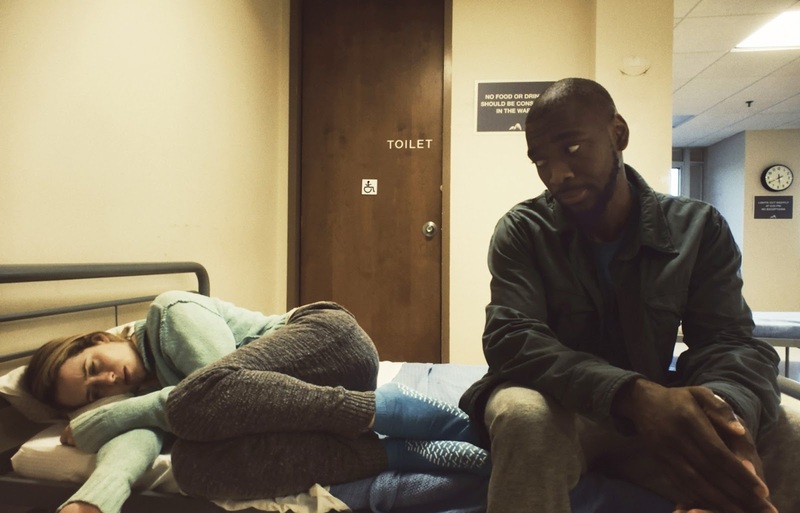 With help from fellow inmate Nate Hoffman (Jay Pharoah), she manages to get word to her mother (Amy Irving) but she just comes up against the immoveable bureaucracy of the hospital. This all appears to be a dig at the American healthcare system, where hospitals can be paid handsomely through a patient’s private medical insurance. Sawyer is convinced that one of the staff (Joshua Leonard) is her old stalker and who is therefore still stalking her. But do we believe her? Is Sawyer really sane or is she actually ill? The question of whether or not Sawyer is a reliable witness to her own sanity is the hook here. Sadly the film then starts to go insane itself as it attempts to shovel something\anything into the large plot holes that have appeared. We can buy the incarceration idea for a while but by now basic logic says somebody would have got her out. The film therefore has to keep inventing twists why this isn’t the case and this just undermines the good story they had put together so far. Luckily Foy’s performance keeps things watchable and the film is good but probably could have been a lot better. Nice idea, shame about the execution.